A mother-daughter duo, Patricia and Gena Fournier bring their own decades of expertise and experience to their firm. As one of the premier family law firms in Tallahassee, they are able to assist the entire North Florida area with their family law legal matters. Gena and Patricia know the emotional toll a family law matter can take on those involved. They are able to guide you through the entire process and make sure you're informed every step of the way. As a partner of Fournier Law, Patricia brings four decades of experience in family law to the firm. Whether your family law case involves custody, asset division, alimony, domestic violence, adoption and private dependency representation or other issues, she will work hard to get results for you. With nearly twenty years of experience in diverse fields of law, Gena can handle a wide variety of cases for her clients. If you need a seasoned domestic violence or family law attorney, count on her to protect your legal rights. As Of Counsel to Fournier Law, Ms. Marsico brings fifteen years of family law experience to the firm. A resident of Florida for thirty years, she relocated from the Washington DC area to serve in the United States Air Force. Ms. Marsico graduated from the University of Tampa with High Honors and went on to graduate with Honors from Stetson University College of Law in 2002. We take the time to prepare you. At Fournier Law, we want our clients to be ready for every step of the legal process. We work hand in hand with our clients to ensure that they are well-prepared, with the ultimate goal of ensuring a successful outcome. Being involved in a legal matter can be a stressful and overwhelming time. We outline the facts of the case to each of our clients so that they can get a full picture of the issues that they are facing, and the options they have to resolve their legal issues. We educate you on the pertinent legal issues. We spend time with our clients to make sure that they understand the legal landscape, and how different laws and cases will impact their matter. Helping our clients to understand the law allows them to make better decisions on how to proceed in their case. You will be armed with knowledge and confidence. We believe that a well-informed client is one who has a much higher likelihood of a successful outcome. Fournier Law knows that when our clients understand the facts and law of their case, they will be less stressed about the process and more confident that we can achieve a good outcome together. Take the time to sit down and anticipate what your life is going to be like after this. Although that can be really hard to visualize at this point, it's always a good idea to know what your future might look like." It might be hard to think about what your future looks like right now, but you don’t have to do it alone. Sometimes life doesn’t go as planned, but the team at Fournier Law is here to help you get your life back on track. Going through a divorce can be difficult – a fact that Gena Fournier can speak to from her own personal experience. It’s important to be proactive and make sure you’re setting yourself up for success for after the divorce is finalized. And if there are children involved, you’ll want to make sure you’re considering their needs as well. With a little help, you can move past this and find a positive resolution. 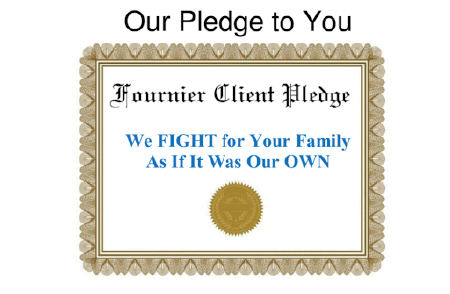 At Fournier Law, we have over 60 years of combined legal experience in the fields of family law, domestic violence, adoption and private dependency representation. Our in-depth knowledge of these areas of law gives us an advantage in assessing cases, advising our clients, and assisting our clients in resolving their cases in a way that works for them. Our attorneys understand that solutions to legal matters should not be one-size-fits-all. We are skilled at finding innovative ways to achieve the results our clients want. This includes consulting with top experts to evaluate your case, exploring options for mediation and negotiation, and litigating cases at trial to achieve our clients’ goals. We offer comprehensive legal services to meet your needs. "I appreciate you taking my cases wholeheartedly, for being such an amazing person and being a damn good attorney!! You just changed many lives for the better"
"The first time I met Gena Wagner I knew I had come to the right place. Her knowledge, confidence and compassion immediately put me at ease and for the first time, I felt as if I finally had someone in my corner who understood what I was going through. I have recommended her to other women in my same situation and will continue to recommend her as often as I can." The highest compliment we can receive is to be referred to one of your clients. If you have a case you think we would be a great fit for. Don't hesitate to reach out. Many of our clients agree and have referred friends and family to our firm because they were so pleased with our work. Contact us today to refer a case to our North Florida family law firm. Family law cases, particularly divorce cases involving children, can be some of the most difficult and stressful matters. At Fournier Law, we understand how trying this time may be. We communicate openly and honestly with our clients, and make sure that they fully understand their case. By educating our clients, we help to alleviate fears about the legal process and ensure that they have realistic expectations about the outcome of their case. Our caring, compassionate advocacy helps to set our clients up for success in their Florida family law cases. With over 60 years of combined experience, the Tallahassee family law attorneys at Fournier Law have in-depth knowledge of Florida family law. We will guide you through the legal process as a team, working together because we understand each case is unique and takes team effort to have a positive resolution. We utilize services of life coaches, business coaches, realtors, counselors and professionals we trust to help develop a specific plan to help our clients come out on the other side of these life changing events for the better.